Peel and mince onion and garlic. Chop mint and dice celery, grate Parmesan cheese, and set everything aside. Melt butter in a large pot over medium heat and sauté minced onion, garlic, and celery for approx. 2 – 3 min., or until fragrant. Add rice and fry over low heat for approx. 5 min. Deglaze with the wine and some warm vegetable broth. Stir until the liquid is absorbed and add peas. Add a ladleful of vegetable broth, it should be enough so that it just covers the rice. Bring to a simmer and cook, stirring often, until the broth is almost absorbed, then add another ladleful or two of broth. Repeat until there is no more broth. As soon as the rice has soaked up all liquid and reached the perfect tender texture, add grated Parmesan cheese and season with salt and pepper to taste. Cover pot and let sit for approx. 5 min. 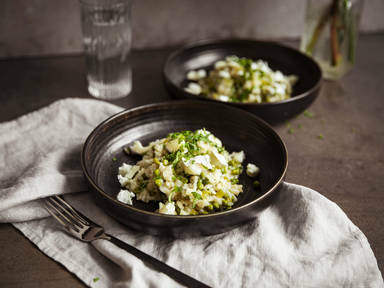 Divide between plates or bowls and top with goat cheese, mint, and a drizzle of olive oil. Enjoy!